In the past, we have partnered with a company called Metalogix to provide SharePoint migration tools to our clients. Metalogix was recently acquired by Quest, which is a large software vendor that provides not only the Metalogix toolset for managing Office 365, but it also provides extensive tools for managing Active Directory, mailbox migrations, and more. 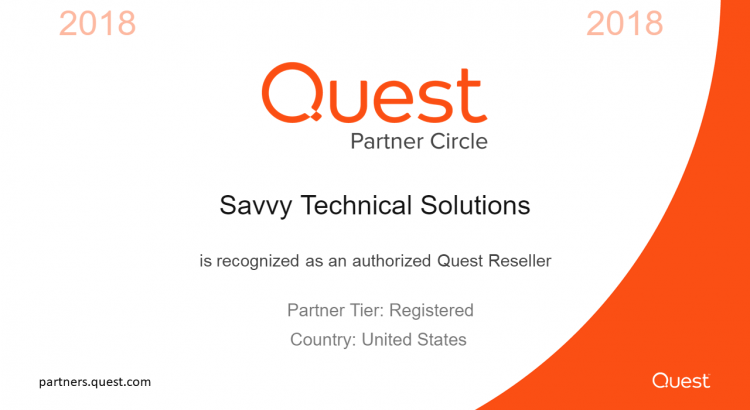 We are happy to have joined up with Quest as a new registered partner and look forward to bringing our clients access to great Office 365 security, management, and migration products. To learn more about our other partnerships, visit our partnership page. To learn about how you can purchase these tools through us, contact us.